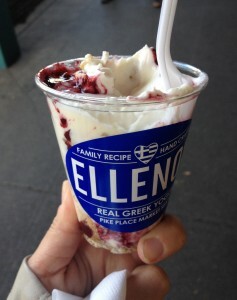 Ellenos Real Greek Yogurt - because why eat ice cream? 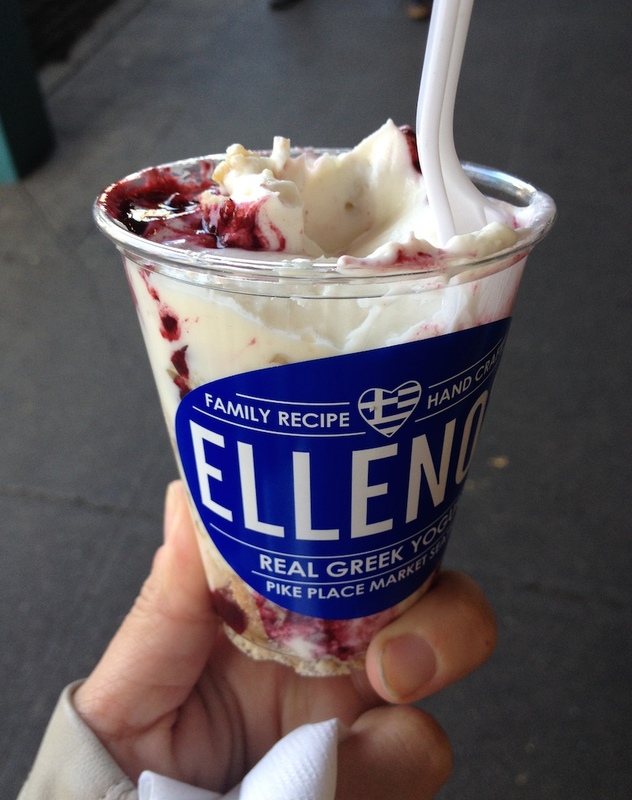 Ellenos Real Greek Yogurt – because why eat ice cream? 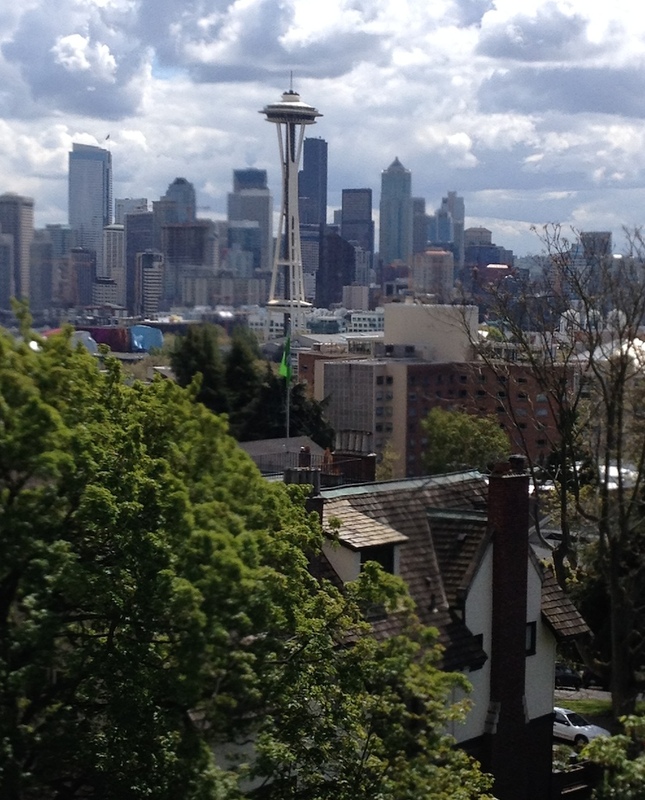 I was in Seattle last spring for a work trip and expected phenomenal food. I was right – everywhere I ate was awesome – but unexpectedly the best thing I ate wasn’t at a nice restaurant but was from a vendor at Pike Place Market. Ellenos Real Greek Yogurt blew my mind. 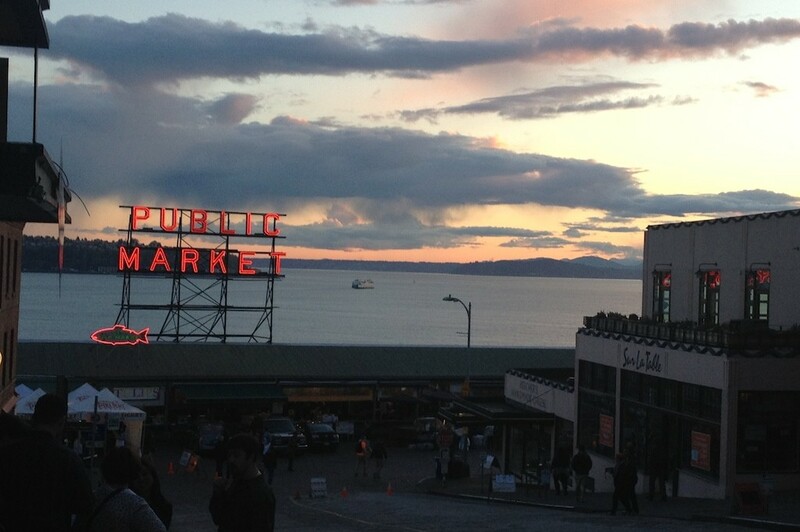 Pikes Place Market at sunset. I know, I know. Vendors and food trucks usually have great food but when I think of food truck or street food I think of BBQ or tacos. I don’t usually imagine that I’ll be ranting and raving over Greek yogurt. Not frozen yogurt, not ice cream, not even frozen greek yogurt. Just run of the mill Greek yogurt. Except it wasn’t run of the mill because there were so many flavors. My absolute favorite was the Marionberry Pie because I love blackberries (Marionberries are a form of blackberry for those who are unaware) and there was pie crust crumble in it. I originally tasted the lemon curd flavor and loved it but tasted the Marionberry Pie after remembering a friend saying that Marionberry was their favorite pie flavor. If it’s good as a pie it’s gotta be good as a yogurt, right? It was like cheesecake with berry topping and I was in complete bliss. Unfortunately unless you buy it at their Pike Place shop the only other way to get some is to order it online. Their prices are very reasonable. Shipping, however, is not. It would’ve cost about $50 extra to ship it from Seattle here. I mean it was awesome, but unless you have deep pockets I’m not sure it’s worth it. If you are in Seattle at some point, make sure you stop by the shop at the corner of Pike Place and Pike Street, grab a container and then take in the views of one of the most beautiful cities in America.